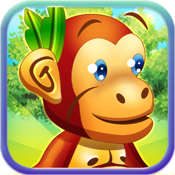 Monkeys and birds are speeding through the forest! Eat fruit and caterpillars to unlock new characters! Tap the left side of the screen to jump! Tap the right side of the screen to shoot!